Sunil Vishnu, 32, and Karthik Kumar, 31, met as classmates at the Mudra Institute of Communication and Advertising (MICA) in Ahmedabad in 1999. Though they were studying branding, marketing and communication, what they were interested in was theatre. So they started Sankalp, MICA’s theatre group. After staging four shows over the two years that they were at the institute, they realized that they wanted to build their careers around theatre. “The writing on the wall was there, though, that no one has ever made money from theatre and the market said it was not possible to do it. But we were 23, and we didn’t care what the market was saying," says Vishnu. So after graduation, they decided to work in the corporate world until they saved up some money to get started. The success of Sankalp was the minor eureka moment. Both Vishnu and Kumar joined start-ups, so they could see first-hand how these organizations ran. They grappled with how to run a financially viable theatre company and spoke to a large number of people who were involved in the performing arts in order to understand this. Two years after they had graduated, on Valentine’s Day in 2003, they quit their jobs and Vishnu joined Kumar in Chennai to start their company. Badal Sircar’s play Evam Indrajit, which is a youth’s reflections on repressed emotions and unanswered questions, was a huge influence on the duo and they decided to name their company Evam. “Our purpose is to make people’s lives, those who come in contact with our brand, happier than when they met us, and to fill their lives with lightness and a sense of purpose. To energize—helping them connect to their own inner giggle, and also to fill them with optimism and hope for themselves and the world around them. We hope to help them take charge and lead themselves towards joy," Vishnu says. Today Evam has evolved from a theatre company to one that has five verticals—public shows, private shows for companies, human resources training programmes through theatre, theatre festivals and a merchandising arm. Muchos, the merchandising division, makes quirky products targeted at the young and the energetic. These products include a recession clock that goes backwards, providing reassurance that the hard times will pass and the happier days will be back. Their operations are still largely based in the south—Chennai, Bangalore and Hyderabad. On the theatre front, they produced Chetan Bhagat’s Five Point Someone and met with huge success. Now they are producing his second book, One Night @ the Call Centre, and are hoping to take it national. “We decided that in the worst case scenario, we would lose our money and be forced to return to our regular jobs. There have been lots of ups and downs and we took four years to start making money. But we stuck with it, since we knew it had potential. 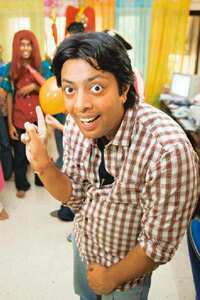 In fact, our parents are still worried about our career choice," Vishnu says. Evam’s success lies in its ability to find new meanings for its existence while maintaining its focus on theatre. Also, the nature of the business and the fact that there is no “structured industry" under which Evam falls keeps the company and its promoters on their feet, inventing continuously. “Artists in India don’t work towards getting an audience or making themselves financially viable. We stand as an example that says that this can be done. It helps that while we are performers at heart, we can talk the language of business to sponsors," Vishnu reveals.